Facebook is trying to get the most our of their instant messaging app Messenger and are continuously trying to make it a standalone app for communication and messaging. In some of the last updates, they introduced some features like money transfer and pretty good third party apps which can be integrated into messenger. Now, perhaps facebook has made the best move in case of instant messaging market. Messenger presently offers a host of services apart from regular messages, like group messaging, voice and video calling, and money transfer (only in the US). 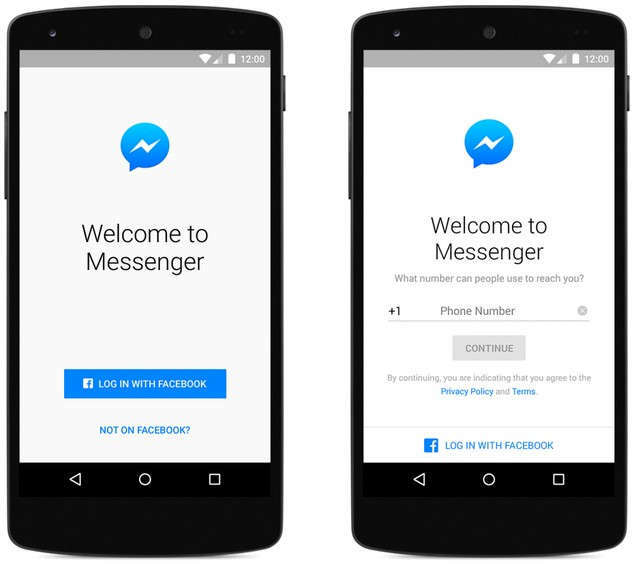 However, now Facebook has announced the people no longer require a Facebook account to log into Messenger, instead they can just log in with their phone number and after they log in they will be able to connect to people whose contact numbers are there in the phone. Here’s how you can use Messenger without a facebook account. But, some features like Facebook contact sync and multi-device message access cannot be availed by non-Facebook users, Messenger can search through a user’s contacts and add people by matching phone numbers that are already registered on Facebook. Regarding this update Facebook’s software engineer Louis Boval wrote on Facebook Newsroom. Currently, this feature is available in some selected regions and countries- Canada, the United States, Peru or Venezuela.